There are 1000s of different ways for you to promote your business details and company logo here at C L Promotions. 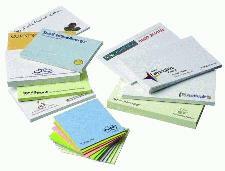 Our Post-it notes Giveaways from C L Promotions can help to promote your business details and company logo. Simply choose which designs you prefer and we'll see to it that they all get printed with your business details and company logo. Then when you give them away to your customers, they'll be thrilled with this practical gift sticking YOUR details around their work place for all to see encouraging repeat and new business. To find out more about our Post-it notes Giveaways click here and fill in the contact form and we'll be in touch. Other promotional and personalised items besides our Post-it notes Giveaways click here to view our entire range.